Vote YES on Measure H! LA CAN is urging all of our supporters to vote YES on Measure H on March 7. 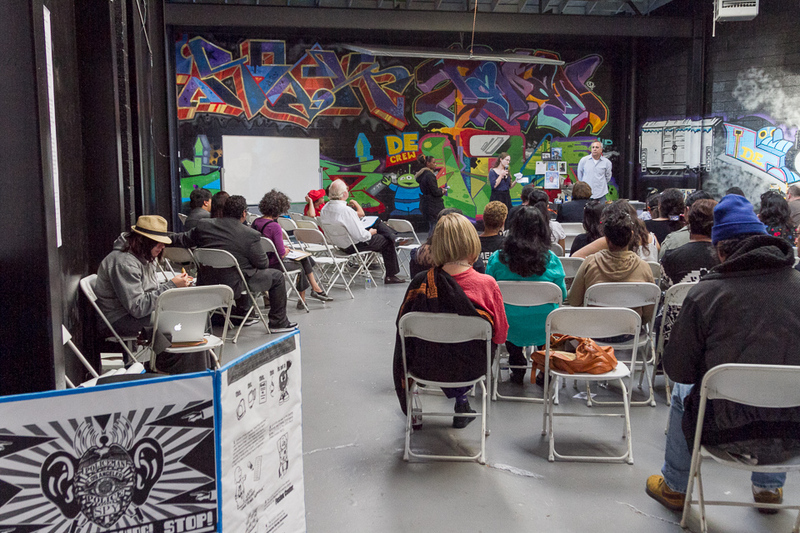 LA CAN Led Effort Leads to Universal EBT at Farmers Markets! Residential Hotel Ordinance Celebrates 8 years of Preserving a DTLA FOR ALL! LAPD Continues to Escalate Police Presence on Main St.
Over the last few weeks, we have seen an increase in LAPD presence and hostile policing on Main St. in Downtown. Residents Plan to Take Action Tomorrow, Tuesday, March 3rd! An Op-Ed in the San Francisco Chronicle from our friend and ally Paul Boden over at the Western Regional Advocacy Project. LA is “crafting a new plan” for Skid Row – unfortunately in reality it’s really just talking points. The July/August 2014 Community Connection is NOW AVAILABLE! 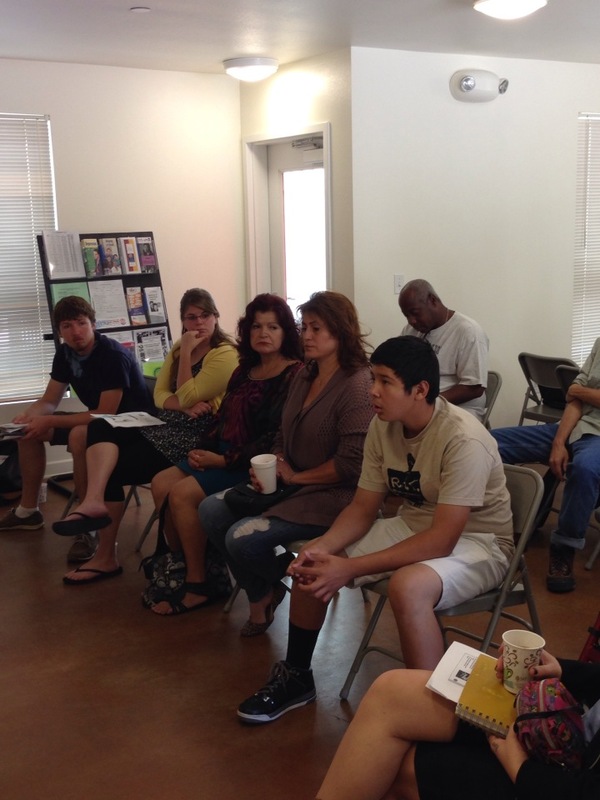 Click HERE to read the July/August 2014 Community Connection. 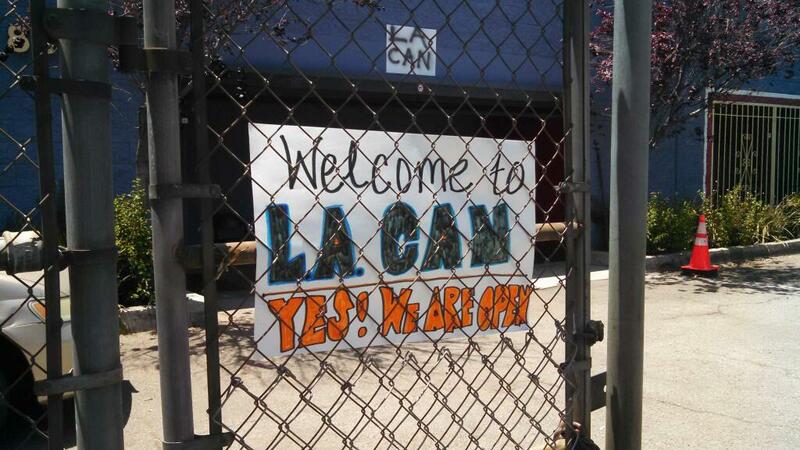 LA CAN has moved to its new home at 838 E. 6th Street! Come through and say hello!Also, we’re still setting up the new space (and phones! ), but our email is working! More updates soon! On Tuesday Morning (May 13), the LA City Council approved funding for Operation Healthy Streets. The April/May 2014 Community Connection is NOW AVAILABLE! Click on the Image above to read the April/May 2014 Community Connection. via the LA Human Right to Housing Collective and the National Economic & Social Rights Initiative. The February/March 2014 Community Connection is NOW AVAILABLE! Click on the Image above to read the February/March 2014 Community Connection. Predictive Policing? What’s there to predict? West Coast Day of Action! The DWAC Variety Show/Fundraiser on February 21 – BUY YOUR TICKETS TODAY! 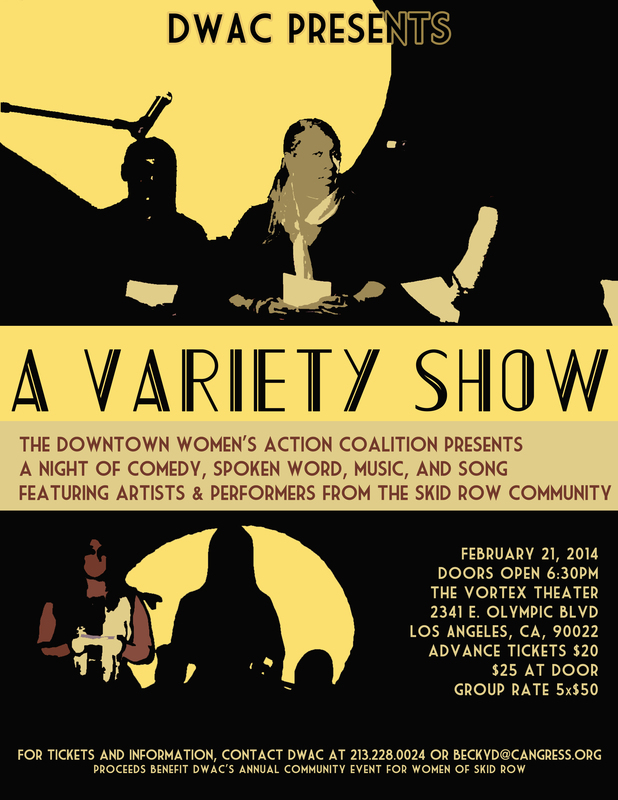 The Downtown’s Women’s Action Coalition presents the DWAC Variety Show/Fundraiser! A night of comedy, spoken word, music and song featuring artists and performers from the Skid Row Community. The December 2013/January 2014 Community Connection is NOW AVAILABLE! What the Hell: So Jaywalking tickets are fine as long as they go to poor, predominantly Black, people in Downtown Los Angeles. Bratton’s Return as NYC’s “Top Cop”: Hold the Press! LA CAN, Hunger Action Los Angeles, and the Greater West Hollywood Food Coalition on Sojourner Truth (Starts at 16:45pm) discussing LaBonge’s Anti-Feeding Ordinance, the Right to Share Food, and the California Homeless Bill of Rights Campaign. 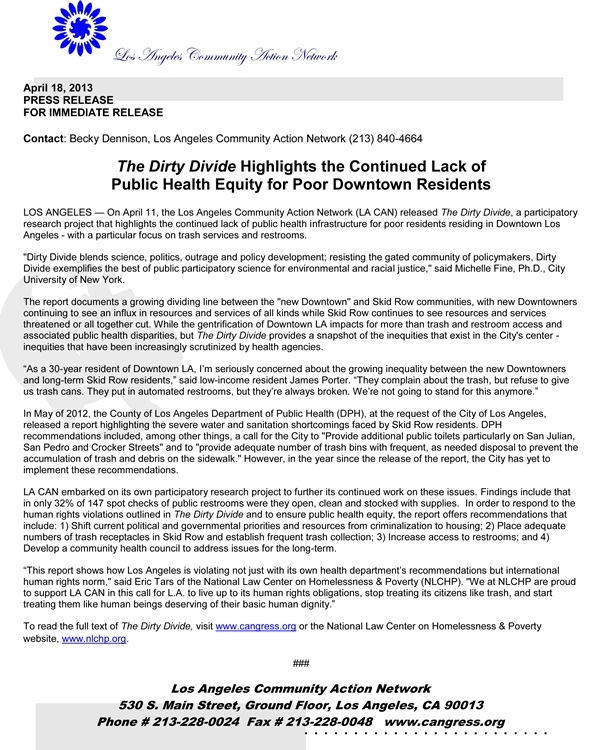 This week LA CAN members and allies continued our fight against the increasing criminalization of poor communities of color throughout the City of Los Angeles. 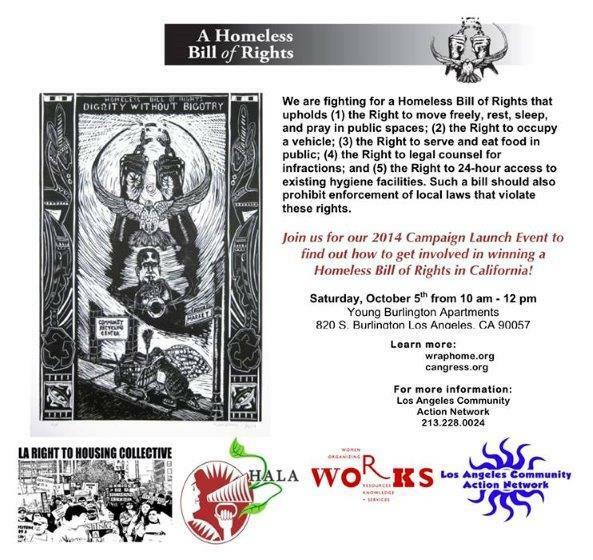 JOIN US at the Homeless Bill of Rights SoCal Launch Event THIS SATURDAY! 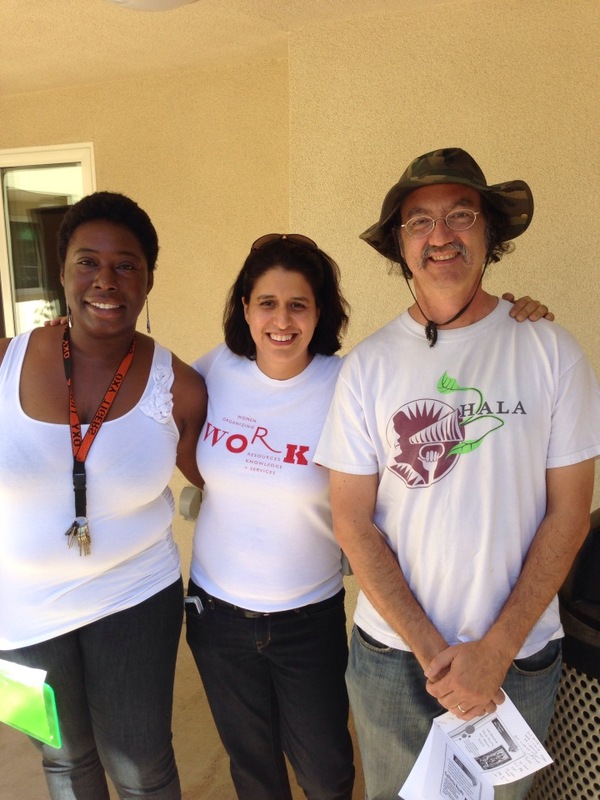 Join LA CAN, Hunger Action LA, the LA Human Right to Housing Collective, W.O.R.K.S. 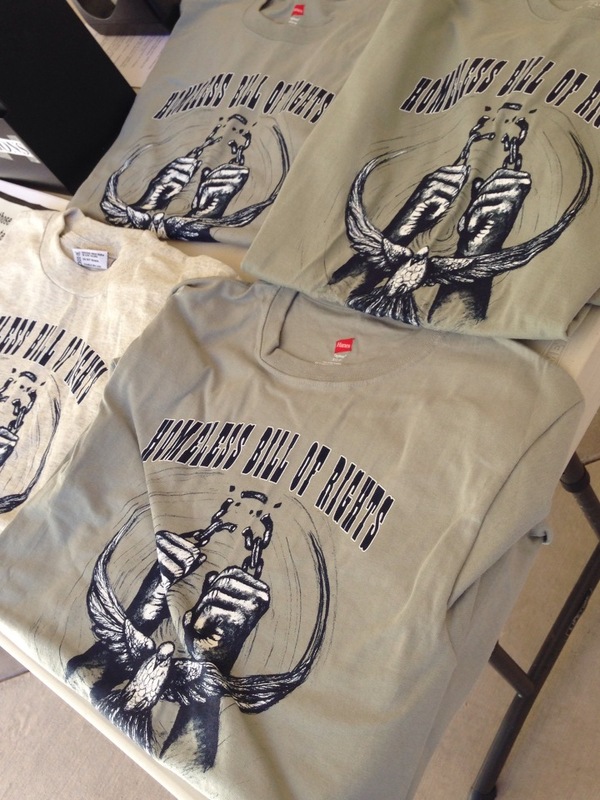 and many more THIS SATURDAY for the Southern California Homeless Bill of Rights Campaign Launch Event. Downtown LA for the California Little Hoover Commission Meeting on Realignment? LA CAN IN THE HOUSE! Mid-Wilshire for Housing Authority of the City of Los Angeles Commission Meeting? LA CAN and friends say, “No New Jails” in Los Angeles County! Deborah Burton Not Guilty on All Charges! Help LA CAN Raise Funds for Our Rooftop Garden! 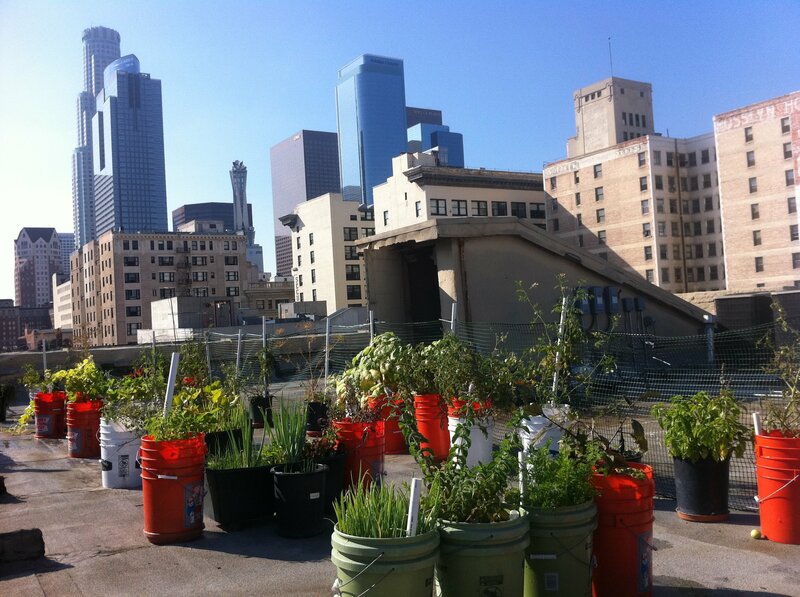 Help LA CAN’s Rooftop Garden continue to fight food insecurity and increase healthy food access in Skid Row. Click HERE to view CBS 2 Coverage of today’s action. 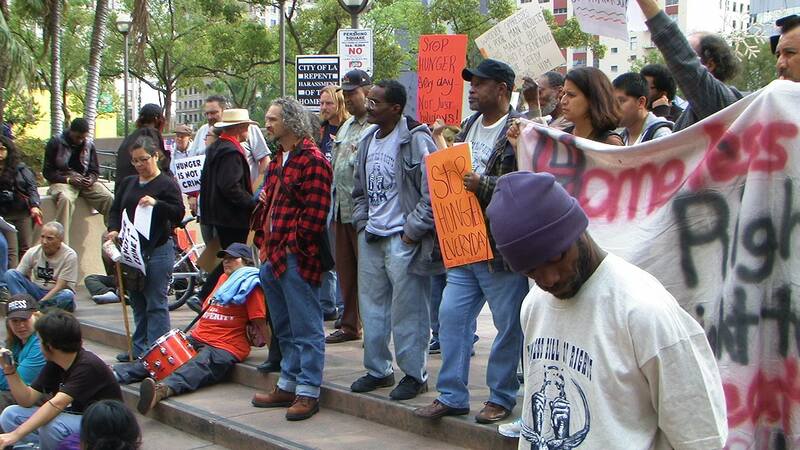 LOS ANGELES (CBSLA.com) — Dozens of human rights protestors gathered Tuesday morning to protest charges filed against a community organizer. This morning, LAPD officers shot into a crowd on the corner of 5th and Wall in Skid Row. At least one person was shot and killed. LA CAN is still looking into the matter and collecting information from witnesses. Homeless Bill of Rights Passes the CA Assembly Judiciary Committee! Deborah Burton’s Trial Expected in Late April – These Unjust Charges Should be Dropped! 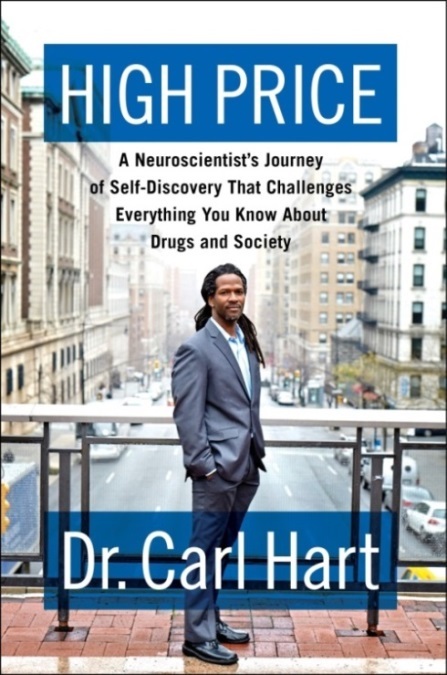 Yesterday, LA CAN was featured on Voices on the Frontlines with Eric Mann. 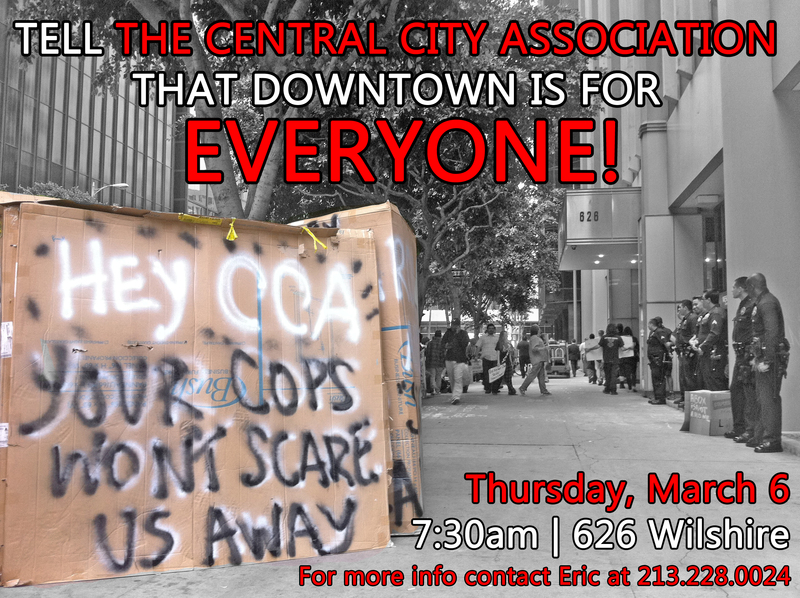 Listen below to find out more about the coordinated efforts of CCEA, LAPD, and the City Attorney to silence the human rights work of LA CAN. Professor Christine Petit Demands that the Charges Against Deborah Burton to be DROPPED! For more information on the unjust charges against Deborah Burton, click HERE. Deborah Burton is just the latest target of the City Attorney’s ongoing campaign to squash protest and political dissent in Los Angeles, including other LA CAN members. BRAND NEW Public Enemy Video for “Get Up Stand Up” (feat. Brother Ali) featuring LA CAN footage and clips from our Operation Skid Row Mini-Documentary! Vote NO on Proposition A! Don’t Support Regressive Sales Taxes to Pay for More Cops! Over 25 Squad Cars and 50 LAPD Officers Deployed in Skid Row Last Night – Does This Make the Community Safer? Hundreds of Residents and Organizations Gather to STOP the CCFO! The Discriminatory Law Dies in Council! 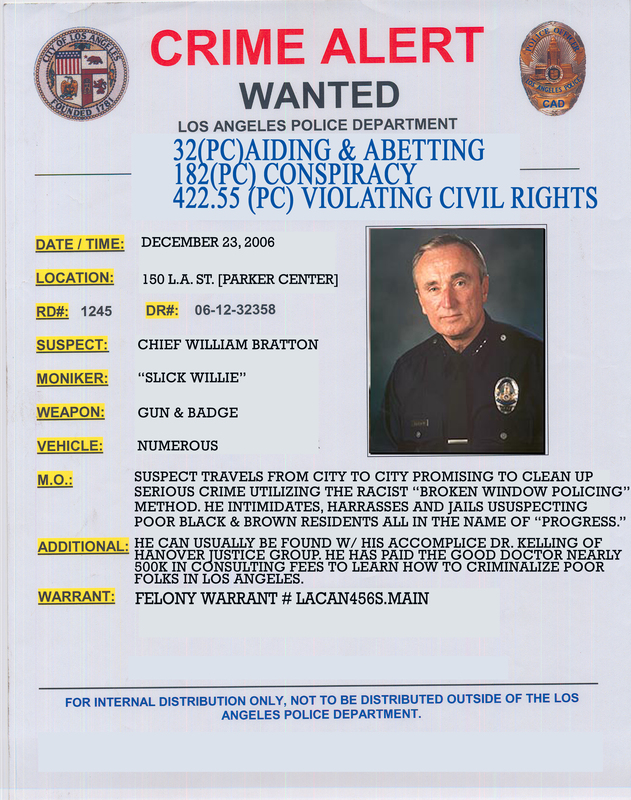 For more information, visit stoplapdspying.org. With almost 150 diverse community members present, several participants commented that the January 19th Townhall was informative, educational, and empowering. This weekend and next week be sure to check out exclusive screenings of Lost Angels at the ArcLight Cinemas in Hollywood. For information on the screenings, visit the Lost Angels Facebook Page HERE. Los Angeles Area Fusion Spy Center Exposed! Communities Demand full Transparency and End to Civil Liberties and Privacy Violations! DECEMBER 1—A coalition of West Coast poor people’s organizations is working with Assemblymember Tom Ammiano (D-San Francisco) to introduce a Homeless Person’s Bill of Rights and Fairness Act on December 3.